Bethesda, for the game and the tools to mod it. glock9mm, for the original Skyrim Unlimited Rings and Amulets mod. The TES5Edit team, for an awesome investigation and analysis tool. NOTICE: I am no longer maintaining Legendary Edition mods, so this mod is now formally unsupported and unmaintained. 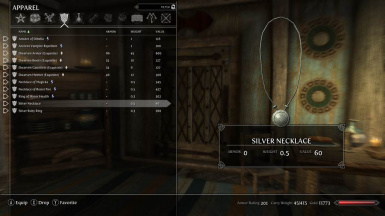 NOTE: Now that EK_RingLimiter (http://skyrim.nexusmods.com/mods/26355) supports amulets and necklaces as well as rings, I consider this mod to be obsolescent and I am no longer using it myself. I will try to continue offering limited support but with a low priority, and I will not continue development. People to use EK_RingLimiter instead. Amongst the earliest mods published for Skyrim were plugins that removed the limitation on the number of rings and amulets that could be worn at once. These tended to work in the same sort of way, by playing tricks with the equipment slots so the game was fooled into allowing more than one ring or amulet at once, usually at the expense of not allowing equipped rings or amulets to be visible when worn. And for most people who didn't like the vanilla limitation (including me) this was an acceptable tradeoff. This mod does not implement some clever way of getting round the limitation while still letting equipped jewelry be visible, instead it addresses the different issue that these early mods had - specifically that they WERE early mods, and as such were developed before the CK was released and/or were made with broken third-party tools. Anyway, this mode replicates SURA's functionality, but is (a) smaller, (b) more compartmentalised, (c) has Dawnguard and Dragonborn support, (d) incorporates any UKSP fixes and (e) was constructed with much more trustworthy tools (and the CK). NOTE NOTE: This is only supported for Skyrim 1.8.151 or later (it uses BOD2 records, rather than the older BODT records). Version 1.0, 2012-11-13: Initial Release. Version 1.1, 2013-01-27: Update to incorporate UKSP 1.2.7 changes. Version 1.2, 2013-02-06: Update to incorporate Dragonborn.